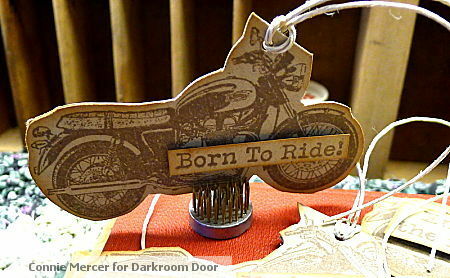 Hi everyone, Connie here with a couple of card ideas using Classic Motorcycles by Darkroom Door. This was a fun set to work with. On these cards I used the 3D-Stempel Farbe by Viva Decor as my background (sponged on glossy cardstock). 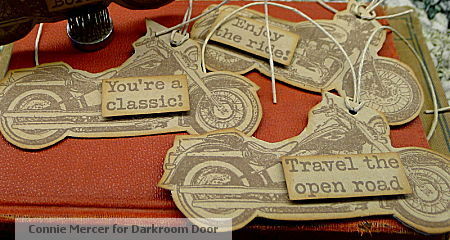 The motorcycles are embossed with black embossing powder on cardstock. These cards are truly made for a free spirited gal. I thought I needed to make something for the guys, so I came up with some very easy gift tags. These will look great tied on a special beverage or gift. The trick on these is to stamp the handle bars (of motorcycle stamp) close to the fold. When you cut out the image leave that part alone. I stamped these on Kraft cardstock and used brown ink. Thanks for stopping by and check out the USA stockist HERE. Oh Connie...these are great! 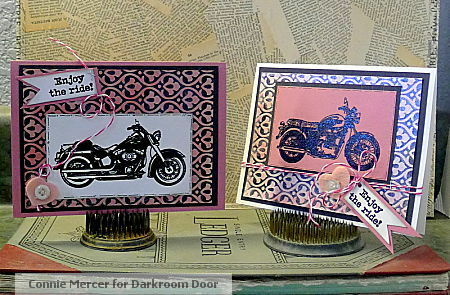 What a wonderful idea to prefold the paper and then stamp the motorcycle! Wow, great work Connie ! Wow wow wowwwwwwwwww! These are amazing!! I am LOVING those bikes!! WOW! Love the vintage bikes. And the cards are great! Any male would love to receive one and if they're motorcycle buffs will keep them! You can't get any more perfect for a guy than a card or tag that has a nice ride on it. :) Awesome work, Connie! Great cards Connie! That shaped card is impressive! Those turned out so neat! LOVE the tags. wow, those are great! So fun! I love how you used the 'enjoy the ride' stamp with these cool cards, Connie! Thank you so much for this post.I fell in love with DArkroom Door stamps on a blog hop.Thrilled to know where to find them here in the USA.The Old Pickup Truck just zoomed to the top of my must have list. I saw this post in my email and it made me smile. The motorcycles are awesome! Love that you did some cards in pink with them. New follower from SB.com - I am loving your style! :) Looking forward to looking back at previous posts for more inspiration! Great work, they look fab!